The secret to the success of a semi-custom series lies in having an attractive design that appeals to a wide range of clients, and ensuring construction to high standards for an attractive price. Heesen has excelled at this, so the launch of Satori, the first of its new 50 Metre Series design, should make us all sit up and pay attention. The starting point for any new design is the hull, and Heesen engaged renowned naval architects Van Oossanen & Associates (VOA) for the task. The result of its studies is a hard-chine hull form with a fine entry. Hull lines were optimised with a satisfactory reduction in resistance, and thus in required engine power. Propulsion efficiency was maximised with optimum-sized propellers and well-shaped shaft appendages. It was certainly a good start in life for a new semi-custom series. As for her looks, Satori is overtly part of the Heesen family with sporty lines that combine the exuberance of the 37 Metre Series with the decorum that one might expect from a larger yacht. Frank Laupman, from Omega Architects was responsible for this, and his triumph was in combining these good looks with a range of spacious deck areas. He was helped in this endeavour by the highly practical requirement to keep the yacht’s tonnage beneath 500GT. Satori’s Californian owner had already put his name against the second yacht in the 50 metre series, but jumped at the opportunity to shave a year off the construction time when the owner of the first project pulled out. For the interior he approached Paris-based designer Rémi Tessier who is renowned for his ‘Pure Design’, where every line, every detail and every aspect is considered, balanced and perfectly executed. On Satori this is seen, for instance, in the sitting area on the main deck aft, which is set out with geometric precision. An open ‘U’ of sofas, with handy tables filling the corners, has two perfectly finished high gloss teak-topped tables at its centre, and a pair of classic, stainless-steel and leather easy chairs at its open end. A similar atmosphere has been achieved just above on the bridge deck. Here, the circular area of the aft portion of the deckhouse, enclosed by glass doors and windows that give exceptional exterior visibility, is made into an observation lounge, at the centre of which three curved, white leather-covered settees are mounted on a round track. In principle, the layout of the interior is conventional, with saloons at the aft of the main and bridge decks, and the master cabin set forward of a lobby and galley that occupy the centre of the main deck. On the lower deck is a stern garage that connects to the engine room, four guest cabins and crew quarters in the bow. A standard layout, certainly, but the interior itself is far from mundane. Although there is a main entrance from the port side-deck, most visitors will enter from the main deck aft between curtains woven from Mongolian horsehair and linen and threaded with a stainless steel wire – a fitting introduction to the sophisticated design elements found in Satori’s interior. From the doors, the spectacular vista extends through a small entrance lobby furnished with a bar of mirror-like stainless steel, topped with backlit white onyx, that serves the aft deck, while the ceiling and walls are clad in rich, highly-polished okavango wood. 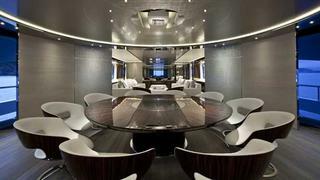 Beyond is a circular dining room and the saloon. The clean lines of the main saloon are simple, yet at the same time highly sophisticated. Unusually, a mirror occupies the forward bulkhead, and this not only creates the impression of longer sight lines, but also conceals a television screen that, at the press of a remote control, can be viewed through the mirror. 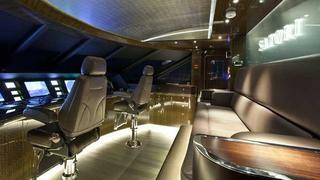 This decorative style and its sumptuous materials flow throughout the yacht, creating a cool, calm and chic atmosphere. The master cabin, forward of the side entrance lobby, is entered through an office that features a white leather sofa and dressing table, while, in the bedroom, a carpet of fine woven leather surrounds the bed. In the en suite, white stone forms the angular counter and bath, and also clads the shower and floor. The four guest cabins – two large full beam VIP cabins and two smaller twins of equal luxury – open off a lower deck lobby lit with a luminous slab of backlit onyx. Galley, pantries and the laundry – key service elements – are well sized and well positioned, while crew are able to appear at the necessary points in the guest areas with drinks and food as if by magic, using their own staircase that connects pantries on the main and bridge decks. Technically speaking, while the yacht houses top quality equipment, all of it is tried and tested rather than ultra-modern, but as yet unproven. 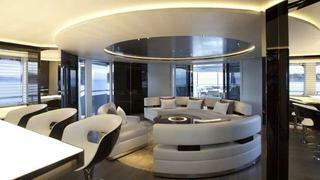 Perhaps the only cutting-edge element of the yacht is its lighting, an important feature of Tessier’s design. He brought in lighting consultants Voyons Voir to create three different ‘scenes’ for each room that set the required mood using different combinations and varying intensities of light. Since launch Satori’s sea-keeping and performance have been seen to benefit hugely from Van Oossanen’s hull design. 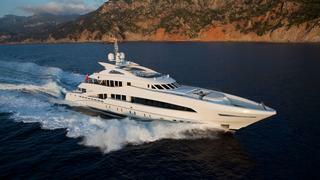 Not only is the yacht perfectly balanced but she is also even better in a seaway than her smaller siblings. Powered by a pair of MTU 2,720kW diesels she has a top speed of 24 knots – making her one of the fastest, if not the fastest, 50 metre yacht afloat.